As of this week, there are two wonderful exhibitions on anatomy on in the Netherlands. The first is The anatomy lesson at the Gemeentemuseum in The Hague, the second is Amazing Models in Museum Boerhaave in Leiden. Leiden and The Hague are only 11 minutes apart by train, so if you’d want to you could visit both within half a day. For those who do not have a chance to visit the exhibitions, or need persuasion, here is a quick review. In this exhibition, all known seventeenth-century Dutch paintings of anatomy lessons have been brought together for the first time. They are presented together with contextual material such as historical anatomy handbooks, models, instruments and preparations, as well as contemporary art works that are inspired by anatomy and medicine, such as Damien Hirst’s Sometimes I Avoid People. Being the historian of medicine I am, I especially loved the fact that I could finally see all the seventeenth-century paintings together, although I have to admit the combination with contemporary art worked quite well. Michiel Jansz van Mierevelt – Anatomy lesson of Dr. Willem van der Meer. Delft 1617. Oil on canvas. Paintings of anatomical lessons were ordered by surgeons’ guilds in the seventeenth century primarily as status symbols. Although the set-up is pretty much identical in all of them – guild members dressed in the typical solemn black clothing with big white collars of the seventeenth-century Dutch Republic – some of them have really cool details. 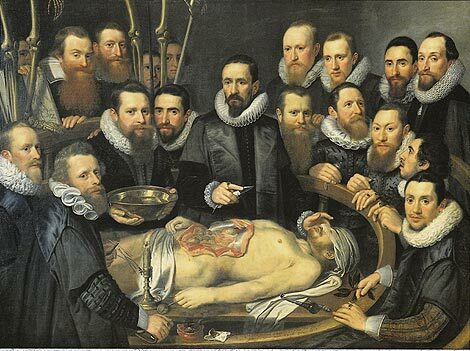 My personal favourite is the one painted by Michiel van Miereveldt, Anatomy lesson of Dr. W. van der Meer, Delft, 1617. In this painting, small details stress the harsh reality of the anatomy lesson: around the opened body, we see a candle, burning incense, and guild members holding twigs of herbs to counter the undoubtedly putrid smell of the decaying corpse. This detail also brings home one of the great benefits of the exhibits in the Amazing models exhibition in Museum Boerhaave: they allowed people to study human anatomy without having to deal with the smell of death. In this amazing exhibition that travels through Europe, late eighteenth- and nineteenth-century wax models from collections in Bologna and Vienna are combined with Museum Boerhaave’s collection of nineteenth-century papier-mâché models from the Auzoux workshop. The sharp contrast between the elegant anatomical Venus made from wax and the raw realism of the wax models of pathologies makes it hard to believe that such vastly different anatomical models were produced within such a short timeframe. However, the reception of some of the Venuses is illustrative here. The first Venuses were ordered by grand duke Pietro Leopold of Tuscany in the 1770s for his museum, La Specola in Florence. In the 1790s, his brother Joseph ordered anatomical wax models, including some Venuses, for the Josephinum in Vienna. However, the Jospehinum had been established in 1785 as medical academy for the military, so this collection was not primarily meant for the education of citizens, but to train military surgeons and physicians. As Anna Maerker has vividly described, the iconography of the Venuses backfired in this context; the envisioned users of the models condemned them as luxury toys, unsuitable for medical training. The Auzoux models, many of them not made much later, are of a much more pragmatic nature: cheaper and easier to handle, and thus immensely popular with educational institutions throughout the nineteenth century. All in all, two exhibitions worth visiting! Maerker, Anna. Model Experts. Wax anatomies and Enlightenment in Florence and Vienna, 1775-1815. Manchester and New York: Manchester University Press, 2011.